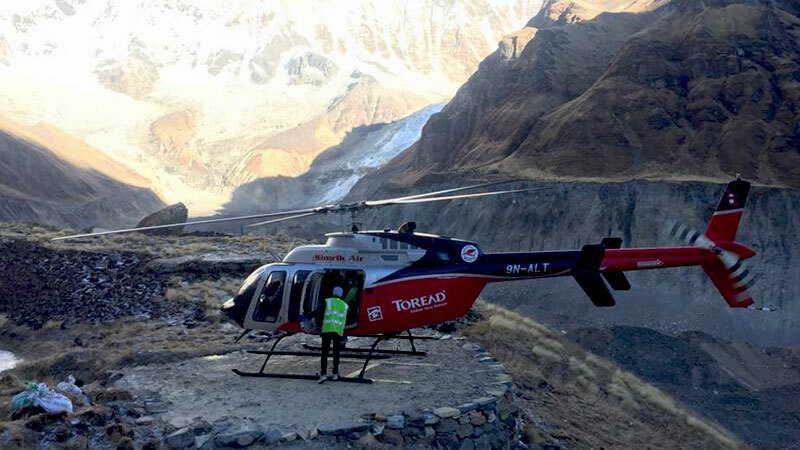 Annapurna Base Camp Helicopter Tour is the ideal option for mountain lovers who have a short period of time in Nepal and desire to be at the base of Annapurna Massif. One requires hiking for five days to reach ABC which can be skipped with a helicopter ride of few minutes. Take breakfast at this miracle place which is ringed with towering snow-capped holy Mountains and experience the breathtaking scene of Annapurna Mountains. Annapurna Helicopter Trip begins with a scenic drive from Kathmandu to Pokhara. Next day morning, transfer to the airport then, complete the formalities and without wasting time fly to Annapurna Base Camp. You will be flying to the north of Pokhara Valley following the massif Himalayas and small villages. A half an hour time will be available to explore this wonderful place and have breakfast. Then, fly back to Pokhara. Explore the natural beautiful attraction around the Pokhara city and fly back to Kathmandu. Annapurna Base Camp Helicopter Tour Cost from Kathmandu will be very expensive than flying from Pokhara. Therefore, we will be driving from Kathmandu to Pokhara on a private car then, chartering helicopter from Pokhara and visit the base of Annapurna. Welcome to Nepal. Our representative will be receiving you at the airport and assisting you in transferring to your hotel. A brief introduction to the whole program and free time. Overnight at Kathmandu. Day 02: Drive to Pokhara. Breakfast at the hotel. Around 8 AM prepare for the journey and drive to Pokhara. Pokhara is 206 km far from Kathmandu and takes around 7 hours by private car. There is an option of participating in an adventurous whitewater river rafting at Trisuli River. Arrival at Pokhara and transfer to the hotel. Free time and overnight at Pokhara. Day 03: Annapurna Base Camp Helicopter Tour. Morning transfer to the airport and complete the formalities. Then, 30 minutes scenic flight to Annapurna Base Camp. Explore the area and take breakfast. Afterwards, fly back to Pokhara. After short rest, we proceed to explore the naturally rich Pokhara City. Visit Bindabasini Temple, Seti George River, Gupteshwor Mahadev Cave, Devi's Fall, and Barahi Temple at Fewa Lake.Free time and overnight at Pokhara. Morning sunrise view from Sarangkot. Back to hotel and take breakfast. Then, drive back to Kathmandu or fly back to Kathmandu. Day 05: Kathmandu Sightseeing Tour. Today you will be visiting the UNESCO World Heritage Sites around Kathmandu Valley. Visit Pashupatinath Temple (the biggest Hindu Temple), Bouddhanath Stupa (the biggest stupa), Swoyambhunath Temple (also known as Monkey Temple), and Kathmandu Durbar Square. Transfer back to your hotel and free time. Overnight at Kathmandu. You will have free time until 12 noon. After that check out from the hotel and transfer to the Kathmandu International Airport. It's time to say goodbye and bring a wonderful memory back to your home. Annapurna Base Camp Helicopter Tour finished here! Kathmandu to Pokhara and back by private vehicle. Annapurna Base Camp Tour by chartered helicopter. Twin bed sharing hotel accommodation in Kathmandu and Pokhara. Pokhara and Kathmandu Sightseeing by private vehicle. Wants some modification on Annapurna Base Camp Helicopter Tour itinerary? contact us to customize it.